Exchanging vows on the sand is seriously dreamy, but planning a beach wedding isn’t without its challenges. As well as the unusual terrain, there’s the heat to consider, not to mention the possible rules and regulations. Ditch the big dress, you’ll be too hot and it’s hard to walk in on the sand. Light fabrics look beautiful blowing in an ocean breeze and are less likely to pick up debris from the beach. Consider trading your veil for fresh flowers and opt for an up-do if you want to avoid your hair looking windswept. Sand and high-heels really don’t mix, so pretty flats or wedges are your best bet. Keep things informal for the men too. A light cotton suit might be the most comfortable option. A stunning ocean backdrop doesn’t need much in the way of décor. Keep things simple, taking inspiration from the harmonious colour palette of the landscape. A well-placed pop of colour can contrast beautifully with the sand and surf. Although flying in a few key suppliers from overseas can help you achieve the wedding of your dreams, some elements such as food and flowers will benefit from a local touch. Look for businesses who understand the area and will be respectful of the beach environment. Research the required paperwork to hold your ceremony on the beach, especially if it’s public. Check for any relevant restrictions and make sure you have a plan in place to meet them. 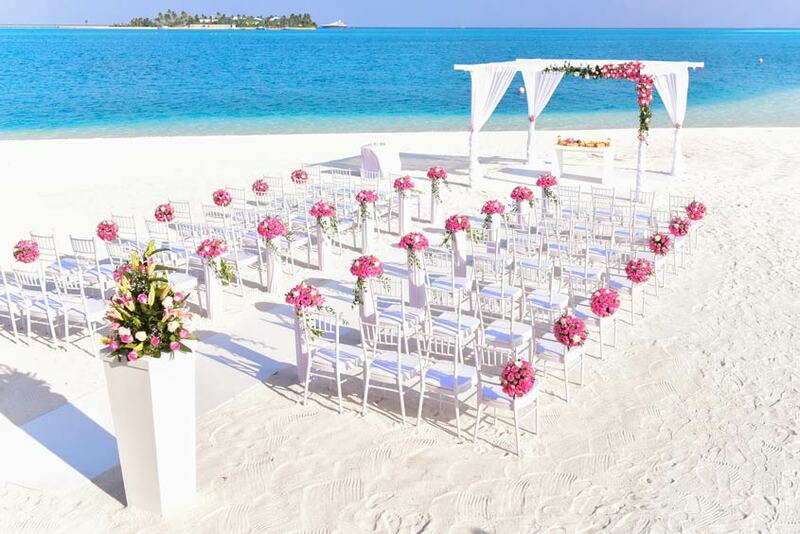 Make sure your guests understand your ceremony will take place on the sand. Mention the beach location on your wedding invitations or wedding website and consider putting together welcome bags containing key items such as sun lotion and insect repellent. Not everyone loves the sun and some, like babies and small children, need to avoid it at all costs. If natural shade is scarce, consider creating a canopy to cover the seating area. On a beach, anything that can blow away probably will. Weigh your orders of service down with pebbles and shells, secure them to chairs with ribbon, or print them on to fans. Wooden benches or folding chairs should be heavy enough to withstand the sea breeze. If you’ve envisioned a pretty petal-lined aisle, be sure to toss them at the very last moment.